Flax is a plant with blue flowers which is mostly present in the grasslands of western Canada and is known for its seed, which is rich with many essential oils. Flaxseed oil is the most natural source of Omega-3 fatty acids that are necessary for healthy function of the cardiovascular, skeletal, nervous, respiratory and digestive system. Flaxseed oil also contains omega-6 and omega-9 essential fatty acids that are in natural ideal ratio, contains B vitamins, potassium, lecithin, magnesium, fiber, proteins and zinc. Until recently experts believed that the best sources of Omega-3 are fish oils. However, clinical trials show that flaxseed oil contains twice as much omega-3 essential fatty acids than products from fish oil. Some nutritionists, researchers and scientists believe that flaxseed oil may be the most important supplement for improving and maintaining health. Omega -3 fatty acids significantly reduce the level of cholesterol in the blood and they are helpful in the treatment of many cardiac diseases like high blood pressure, arteriosclerosis, thrombosis, cardiac arrhythmia, etc. Consuming essential fatty acids as a dietary supplement gives excellent results in the treatment of rheumatoid arthritis, osteoporosis and other bone meteoropathic diseases. Flaxseed oil nourishes and maintains optimal function in the nervous system and of brain, improves memory, concentration and the mood. It strengthens the immune system and it is recommended for general health maintenance of the entire organism. Cancer Prevention – Studies have shown that flaxseeds provide protection against breast cancer, prostate cancer, and colon cancer. Flaxseeds contain Lignans, which provide protection against cancers that are sensitive to hormones. Lignans also block the enzymes that are involved in hormone metabolism and inhibits the growth of the tumor cells. Reduces High Cholesterol – Flaxseed oil is beneficial in helping to reduce high cholesterol. It’s important to keep in mind however, that this alone cannot be totally effective in reducing cholesterol levels, an overhaul of overall diet must work in conjunction with flaxseed oil. Fights Crohn’s Disease – Although we have already covered some of the gastrointestinal benefits of flaxseed oil, Crohn’s disease is a health condition that afflicts people all around the world. 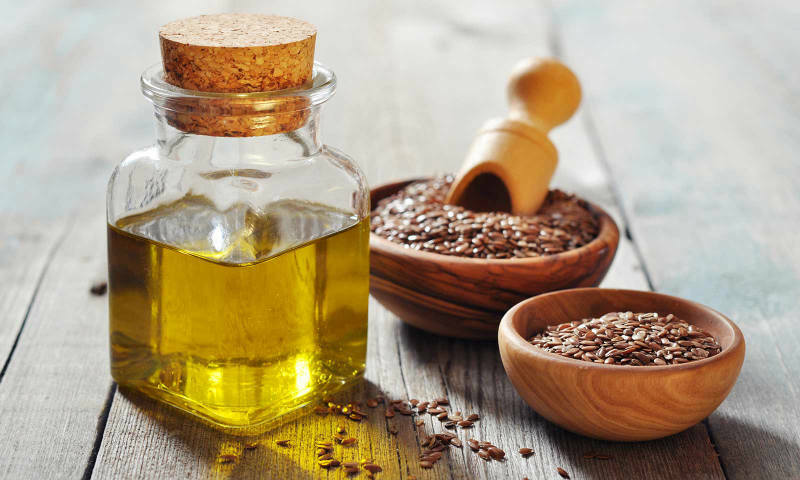 Flaxseed oil research has shown a positive relationship between the inflammation of the colon and intestinal tract with consumption of this oil. Promotes Eye Health – Some of the hormones in flaxseed influence the amount of fluid in your eyes, which can be a very annoying condition. Dry eyes can be prevented with consistent use of flaxseed oil in the diet. It can also prevent more serious forms of this condition, such as Sjogren’s syndrome. Weight Loss – Like all other nuts and seeds, flaxseed is also rich in healthy and dietary fats, with 3g in 1tsp. So it helps in curbing your appetite by keeping you full throughout the day. It helps to build the muscle mass, which burns more calories that fat. The high fiber content aids healthy digestion, and thus, supplements weight loss.